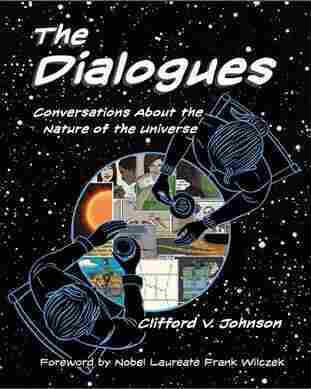 'The Dialogues' Takes On Physics And Reality In Words And Pictures : 13.7: Cosmos And Culture Commentator Adam Frank interviews physicist Clifford Johnson, who has taken a new approach to the exploration of questions about the nature of the universe — the graphic novel. An image from Clifford Johnson's The Dialogues: Conversations about the Nature of the Universe. The origin of the universe, the nature of space, the reality of time: These are ancient questions. Libraries across the world are filled with heavy books that are, themselves, heavy with equations on these issues. But how many graphic novels are exploring these questions? More importantly, how many graphic novels written and drawn by expert theoretical physicists are there? 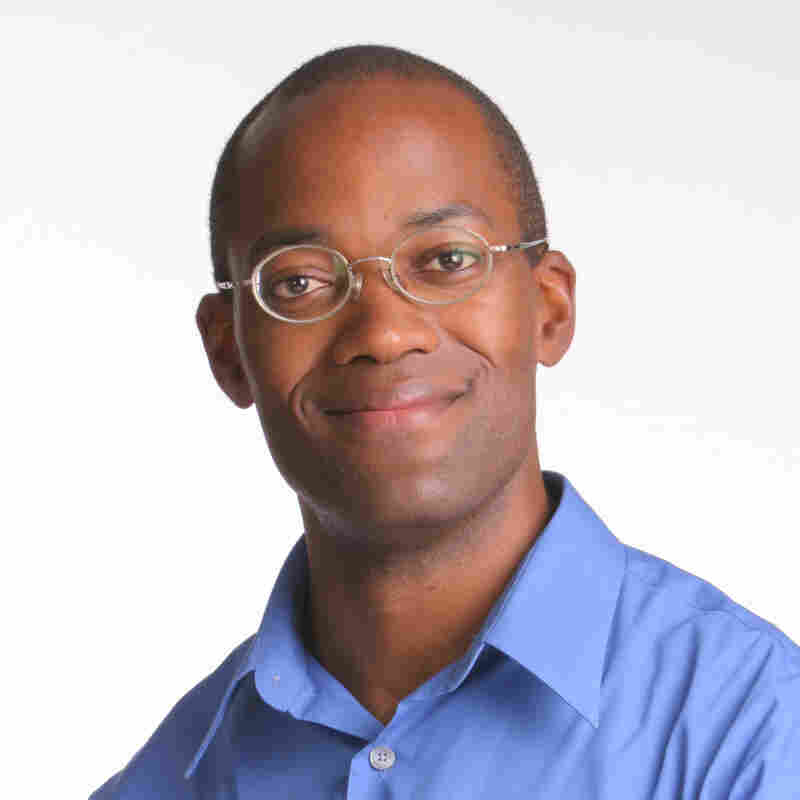 Well, happily for us all, the answer to the latter question is "at least one," thanks to University of Southern California physicist Clifford Johnson. Johnson's new book The Dialogues: Conversations about the Nature of the Universe is a penetrating exploration of questions — that are both ancient and modern — about the nature of the universe. I found The Dialogues to be compelling, and the use of the graphic novel format only deepened that impression. After finishing the book I wanted to understand more about how this project took shape. Clifford Johnson was kind enough to answer my questions, included below, over a series of emails. Why did you decide to use this format? Once I decided that it was important to me to present ideas in the form of an accessible series of conversations, I realized a bit later that it would be really great to see who was having the conversations: ordinary people of all kinds. Then, I thought it would be valuable to see where the conversations were taking place — out there in the world, in cafes, on the street, etc. So visually, I get to drive home the idea that science is in the mouths of everyday people, and out there in the world, as opposed to specialists in a lab or seminar room. Are you a comic book fan? If so, what kind of stuff did, or do, you read? Who are the artists that you really like? I do like comics and graphic novels. It's a wonderful form that still suffers from the perception that it is just a particular genre (usually, superheroes and so forth), while in fact it is a powerful expressive medium that can be used for any topic. I like to read good stories, well told, in a range of genres and subjects. Glancing up at my shelves, I can see favorites like Jillian and Mariko Tamaki's This One Summer, Sonny Liew's The Art of Charlie Chan Hock Chye, Ed Brubaker and Sean Phillip's Criminal, and David Mazzucchelli's Asterios Polyp. Actually, Mazzucchelli is a great master storyteller/artist who connects back to my days of reading superhero comics more, many decades ago. His work with Frank Miller from the 1980s represents some of the greatest work of the genre. I love many other kinds of artists, too, and the artists on the other books I mentioned are wonderful examples. I'd love to read more graphic books for grown ups that are primarily about science ideas (as opposed to biographical accounts of scientists, or adventure stories that include science). Surprisingly, there just aren't many, so that's a reason I made mine. Your artwork is great. How long have you been drawing? Are you self-taught? Thanks! Yes, I'm self-taught. Like most people, I could sketch and doodle somewhat. But in 2010 or so, I set about trying to see if I could raise my earnest but rudimentary and very limited drawing ability to a higher level so that I could do the book, and I succeeded through gradually figuring out what my strengths and weaknesses were and then practicing. A lot. Which is really the only way to learn to draw. There lots of books about drawing out there and you can take from them what you need about the drawing process and then off you go. Anyone can do it, really. I really believe that. It's mostly just confidence, willingness, and then lots of practice. Kind of like science. You take on a number of topics in the book, ranging from physics to the nature of science. What do you think are the most important questions at the forefront of physics today? Oh, it really isn't possible to properly rank the questions because we don't know which questions, when answered, will help us uncover and address the most far-reaching issues about our universe. So the most honest thing to do, I think, is talk about what are the most interesting questions to me right now. I think that black holes have become one of the most central laboratories of thought in physics, and now, to add to that, also actual physical laboratories, with LIGO and VIRGO, detecting gravitational wave signals from them when they collide with each other! So big questions on the theory side are: What are black holes, truly, when you bring both relativity and quantum physics together? Observations of astrophysical black holes seem to confirm that they behave very much like Einstein's relativity tells us they should, but there are many reasons to think that the inside of them may be utterly different from what Einstein's theory tells us. Quantum effects radically change the inside, and possibly our entire notion of what space and time are. This is more than idle theoretical musing because this may also teach us about how space and time behaved in the very early times of the universe's existence, giving rise to everything we see today. Also, ideas about that quantum nature may turn out to be testable if it affects the details of how black holes settle down after colliding with each other and merging. Signs of the right answers may be encoded in those gravitational waves we are seeing! Also on my mind is the fact that there are many unexpected applications of thinking about the physics of black holes at the quantum level — entirely new computational tools, applicable to other fields of physics, like nuclear and condensed matter physics, seem to emerge from that endeavor, and so one thing I think about is whether there might be even more applications than we've thought of so far. On the same point, what do you think it's most important for people to understand about how science, at this kind of frontier, is done? What I mean is, cosmology and quantum gravity are different from doing something like condensed matter experiments. We are really at a hairy edge of our ideas. How should folks think about how we go about thinking about these fields? Ah! This is something that comes up in one of the conversations in the book. Two characters talk about this issue, with one of them emphasizing just how difficult (maybe impossible) it is to try to force research in this area to go in some specific direction. The history of science, and this field in particular, shows how important it is to have a large degree of undirected, speculative, and idiosyncratic activity because this is where many unexpected and useful connections are often made. 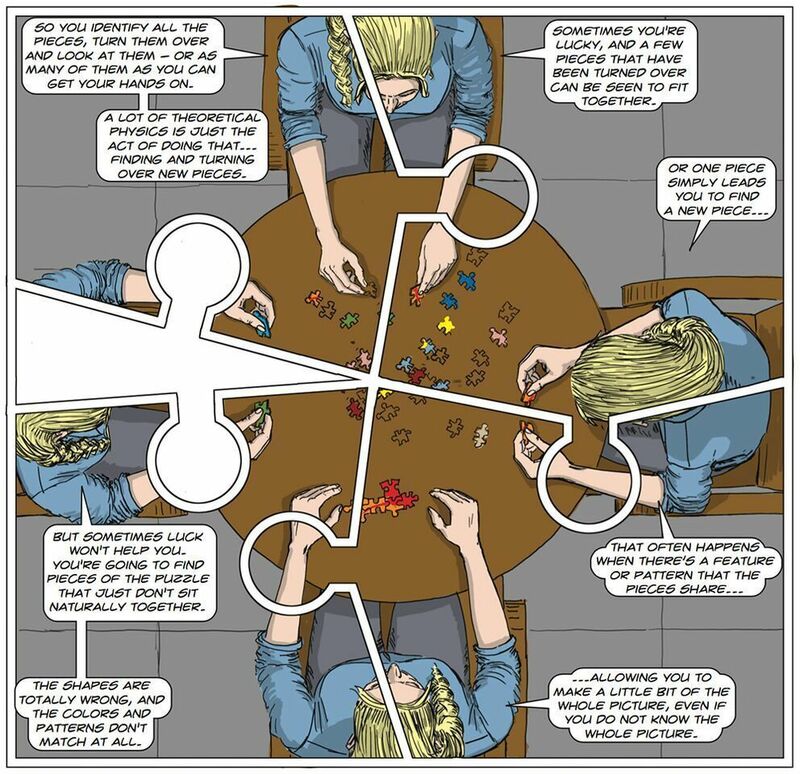 (In the book, there's an analogy with what's going on when doing a jigsaw puzzle, in fact.) It does not mean that we have lots of people sitting around doing utter nonsense or just free-associating. They are doing solid research on diverse topics — asking specific questions and getting answers to them using scientific methods, and reporting the results in peer-reviewed journals. You never know when those results are going to be useful, or inspire useful work from others. In a field asking the most far reaching questions about the very nature of our existence, you need to have this kind of activity going on, because we regularly get surprises when we look closely at the universe. It is all part of the vast activity in science that gets ignored by those in the media, entertainment, and so forth, who tell the story of how science is done. They tell you about the lone geniuses and the eureka moments, but they don't tell you about the work of many who made those breakthroughs possible.